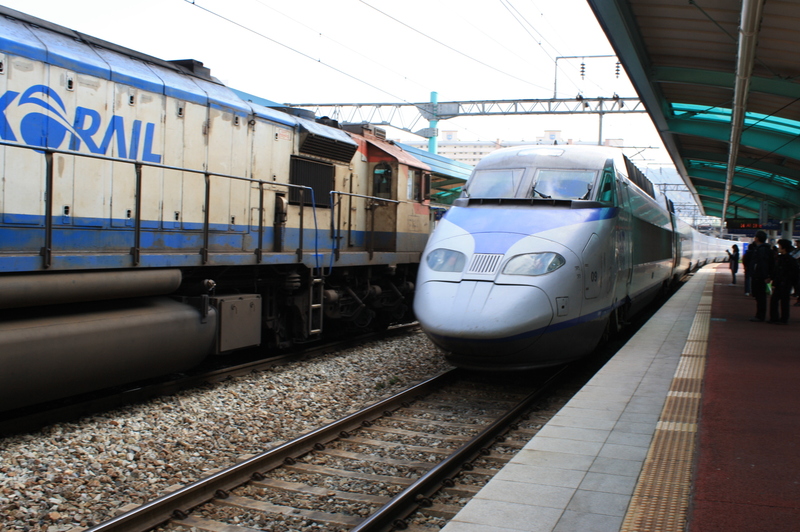 The Bullet Train that took us to Seoul - in a hurry! 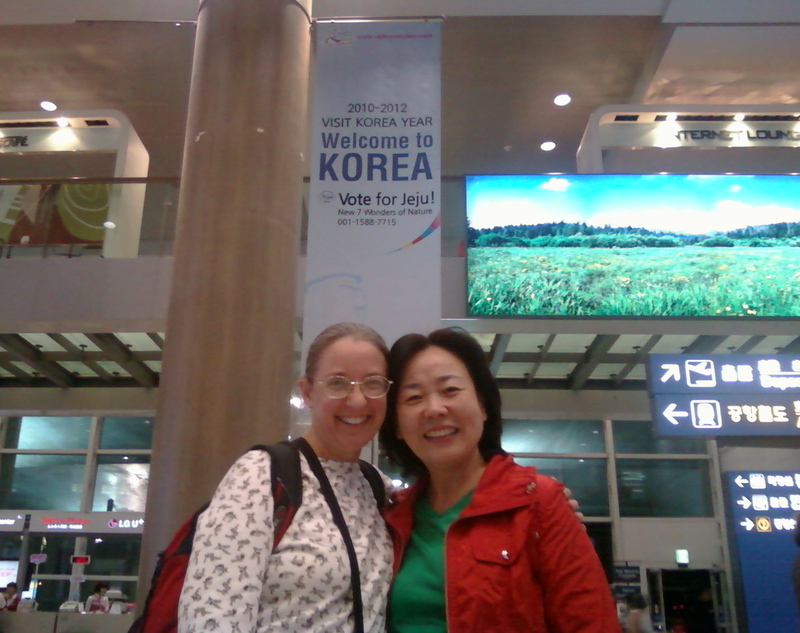 I was sitting in the railway station with a ticket for my destination…Waiting for the bullet train that would take us from Seoul to Daejeon, where I’d be preaching at the Central Presbyterian Church (where our friend Sue Makin worships). I was fascinated as I watched a little boy – maybe three years old – sitting patiently with his mother. 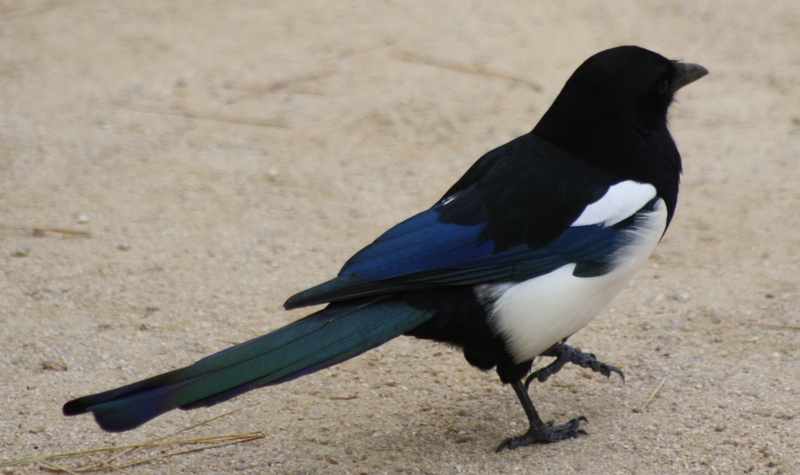 Their backs were to me, and I thoroughly enjoyed the way this little man was devouring his breakfast – a bran muffin and a carton of milk. As I did so, it occurred to me that in all probability, this was the only time in my life I would ever see this boy. Most of the children in my life are experienced in the context of relationship…I love watching children grow. But this little boy will be forever in my mind a three year old eating a muffin while wearing a giant smile. I imagined this boy as a teenager going to school…as a young man entering the Korean military… I wondered about him as a father, and thought about what kind of job he might have, and whether he’d ever go fishing. He has an entire life – it may end today, or he may outlive me by decades…and all I see is fifteen minutes in the Seoul railway station. The limitations of space and time. 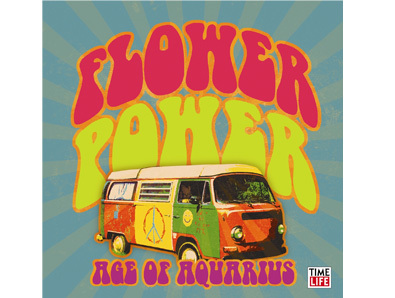 I can only see and potentially know anyone in the now. And maybe, if I’m blessed, the “nows” will string together and we can have a story, you and I. But how amazing is it that God sees us and knows us as ourselves – in totality. God, who was, who is, and who is to come, knows me for myself and my story – not only for the now. Somehow, sitting in that station watching thousands of God-beloved children and adults rush around me, that thought comforted me greatly. Perhaps it will you, as well. Many of the congregants at the English service are people who teach English in town. I thought more about that boy as I brushed up against some of God’s favorite people later in the day, too. We visited the Central Presbyterian Church in Daejeon, which is not nearly as large as the SaRang Community Church we visited on 10/23. In fact, the pastor to whom I spoke at Central thought that his congregation had “only” 12,000 members or so (in comparison to SaRang’s 60,000!). I was preaching at the English Language service, which met on the NINTH FLOOR of the church building. We had a contemporary service led by a Deacon from the church (they have been searching for an English Language pastor for three years) and a worship band. There were maybe three dozen folks in the room, but they were fully engaged in the worship and in the Word. 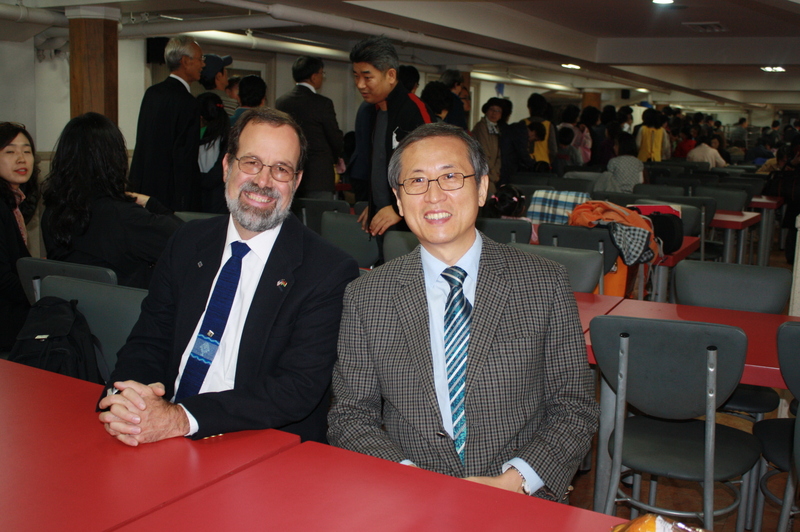 After worship, we joined folks from the Korean Language service in the cafeteria downstairs, where we were treated to a full lunch. 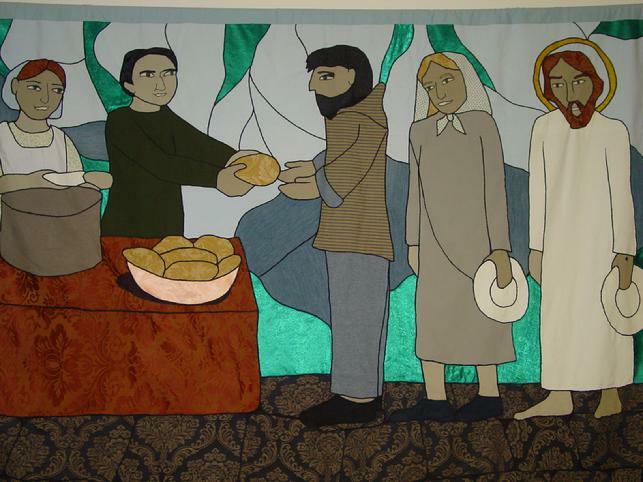 I learned that the congregation serves a free hot meal every day to anyone who wants it – it was the only type of recognition I saw that this society has some systemic poverty that must be addressed at some level. 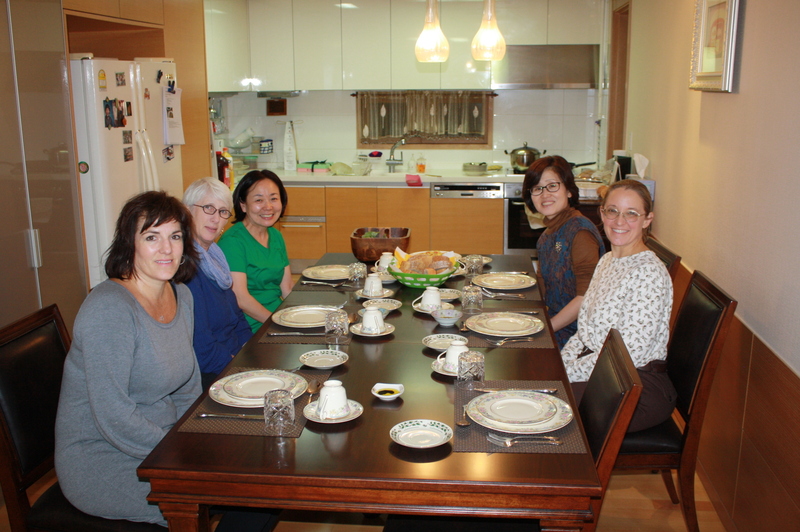 During the meal, we enjoyed getting caught up with our friend Sue, as well as David and his wife, a young woman named Béa (an exchange student from the Philippines to Korea for this semester) and several other worship leaders. After the lunch, we hustled back to the train station, where we caught the bullet train and rode back to Seoul – often at speeds in excess of 250 kilometers/hour (that’s about 155 mph). The ride was quiet and smooth. The ticket for that hour-long ride was about $43 round trip. 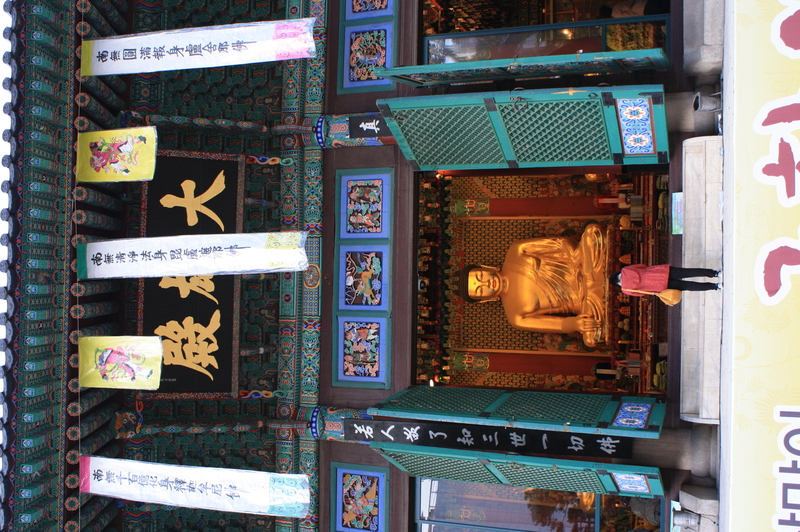 I thought about my little muffin-eating friend again when we visited the Jogyesa, the center for Zen Buddhism in Korea and the largest Buddhist temple in Seoul. Statues of the Buddha towered more than 30 feet high inside the very traditional building that was adorned with paper prayer lanterns and filled with two very distinct groups of people. Many people had come, as I had, to see this site, and we respectfully removed our shoes and walked through the worship center, awash in the mystery and exotic nature of the ritual. Many more, it seemed, had come to worship, and were engaged in a pattern of standing, kneeling, and prostration in the direction of the Buddha. There was no sense of organized worship, so far as I could tell: it was totally a “choose your own adventure” sort of private worship. 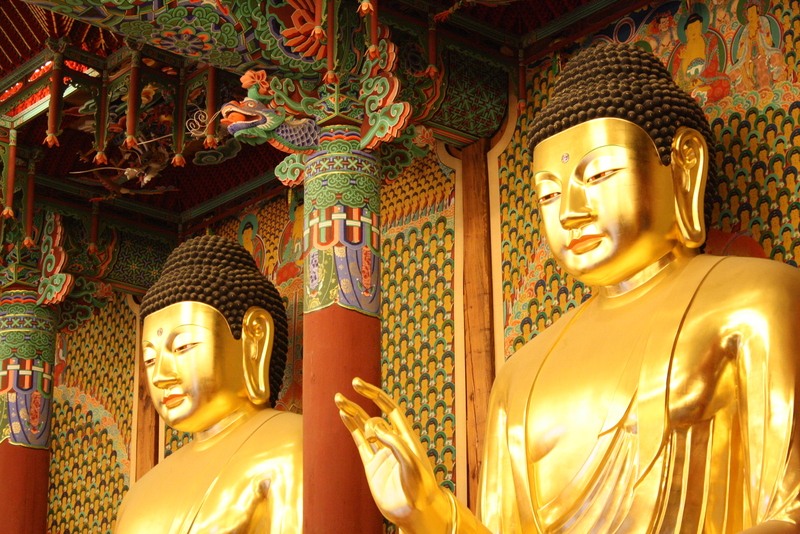 The feet of the Buddhas were covered with offerings of food – fresh fruit and sacks of rice and other gifts. One entire wall was covered with thousands of small statues, which I later discovered to be urns containing the ashes of the dead. 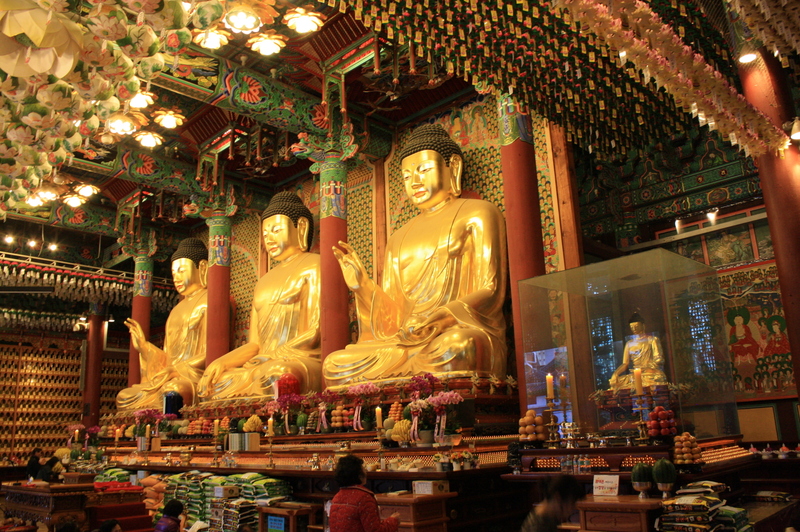 The Buddhas at the Jogyesa surrounded by worshipers and their offerings. Maybe my little friend from the train station will grow up worshiping like that. Or maybe he’ll grow up preaching to his friends about Jesus. Or maybe he’ll grow up not even thinking about God, or the gods, or the Holy. Who knows? Not me. As I went to bed with the images of that day swirling in my mind, I was less concerned about whether or not the little man believes in God than I was grateful that God already believes in him. As I write this, I’m sitting in the airport, waiting to board a flight that leaves Seoul at 11 a.m. on Monday Oct. 31, and after flying for almost 13 hours, will arrive in Chicago at 9:40 a.m. on Monday Oct. 31. I have almost two full Mondays this week (and I got cheated out of a Friday two weeks ago!). How can this be? God only knows. But, as my friend Barbara Voeltzel used to say, “Thank God for God.” Because he does. He knows and sees me on all the Mondays and all the Fridays of my life. And that is a blessing. 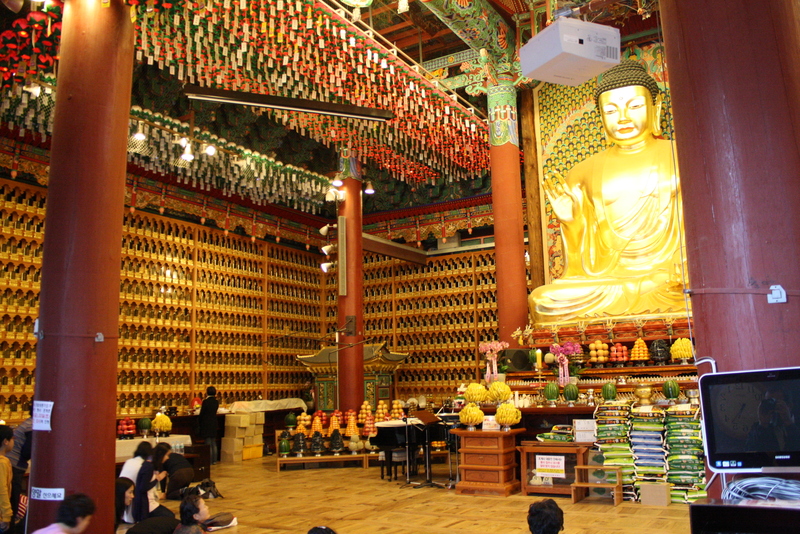 One wall at the Jogyesa is covered with urns containing ashes of the dead. If I’m right, that’s “Hello” from Korea. The word I’ve been saying sounds like “ahn-yung-HAS-see-oh” and people are smiling back, so I’m sticking with it. I have posted a couple of stories from some of the wonderful and intense times of our visit here; I thought that today I might simply share some of the lighter side of things. 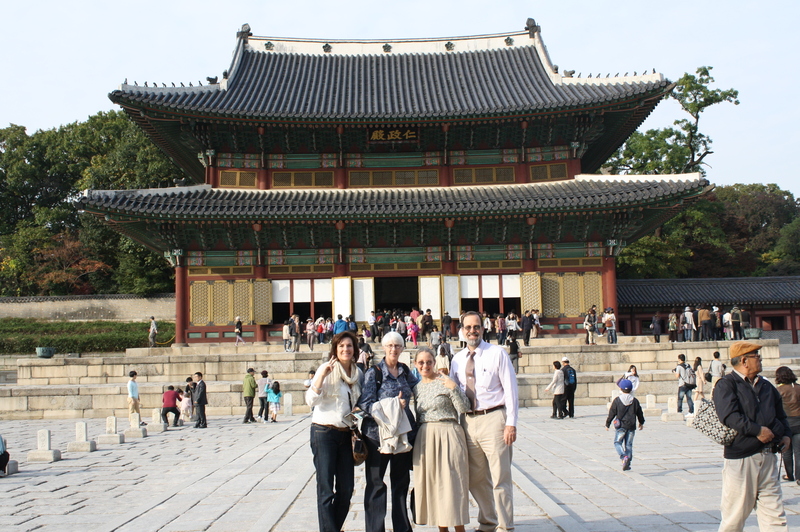 We are in Seoul because the Children’s School at CMU, where Sharon is the Director, has an emerging partnership with Duksung Women’s University here. 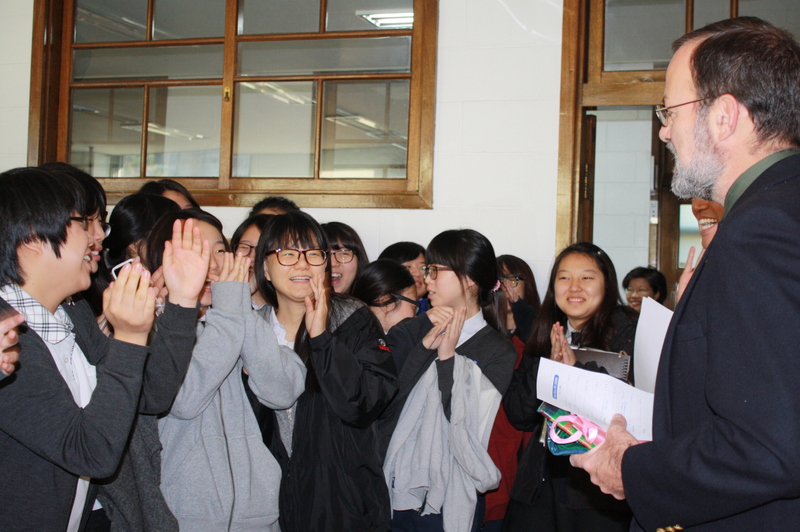 In January, about a dozen students from Duksung visited CMU, and Sharon was asked to make a return visit to explore ways to deepen the collaboration. One of the reasons that seems logical is that Dr. Myunghee Kang, who teaches at Duksung, was a Grad Student with Sharon at the University of Rochester back in the late ’80s. Myunghee greeted us at the airport and welcomed us into her home. This is the reunion and welcome we got at the airport! Other staff and students from the University have made sure that in addition to the formal work of partnership, we’ve had a chance to see the sights. 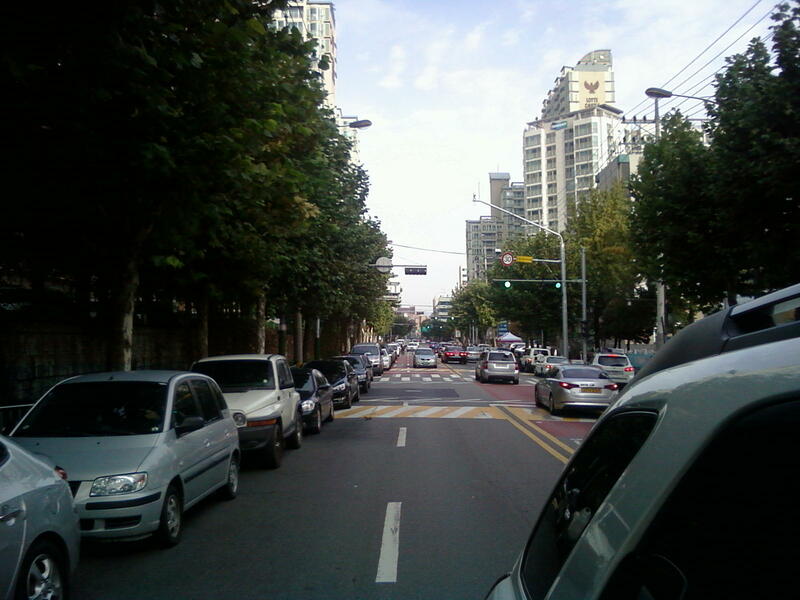 We’ve toured several parts of downtown Seoul, which has a long and rich history. 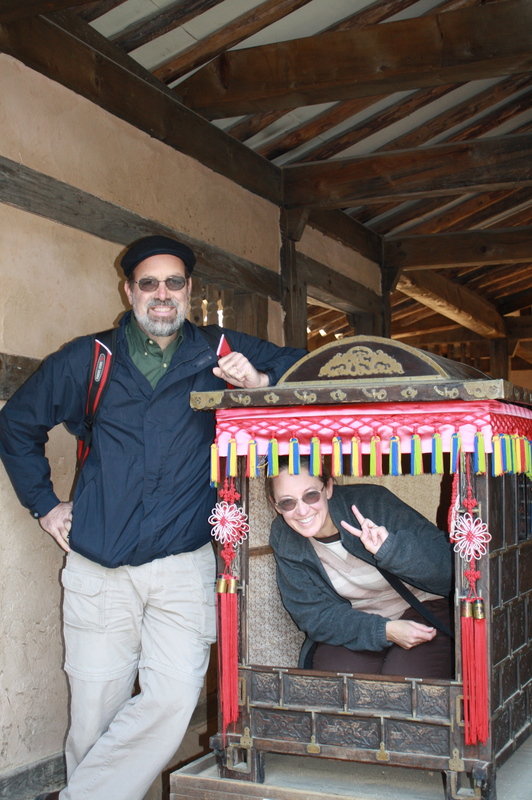 We enjoyed a visit to the Korean Folk Village, which depicts life in rural Korea in the 19th century (If you’ve ever been to Old Bedford Village, that’s the sort of thing we’re looking at). And we have eaten. Mounds of amazingly spiced and delicious food, some steaming, some cold; some spicy, some mild; some raw, some cooked; but all delightful and ample! One of the centerpieces of every day is food. Here, some of the students are preparing to teach us how to eat! 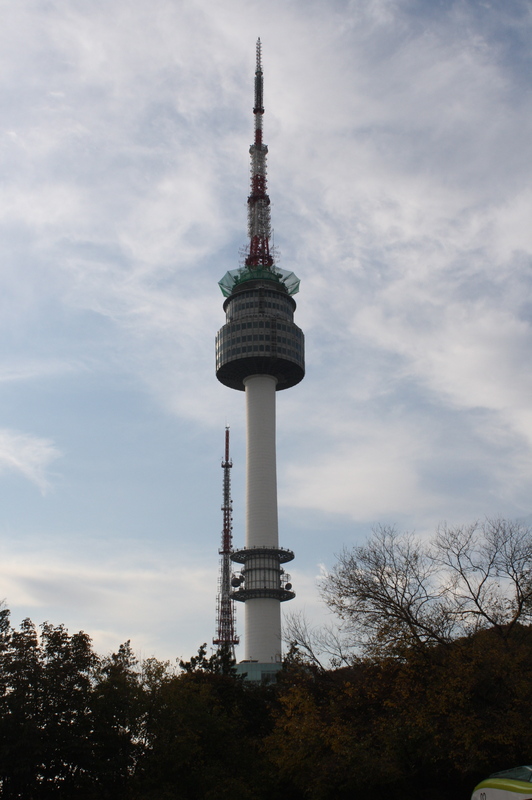 The "N Tower" is located on Seoul's Namsan Mountain. It's about half the size of the CN tower in Toronto. 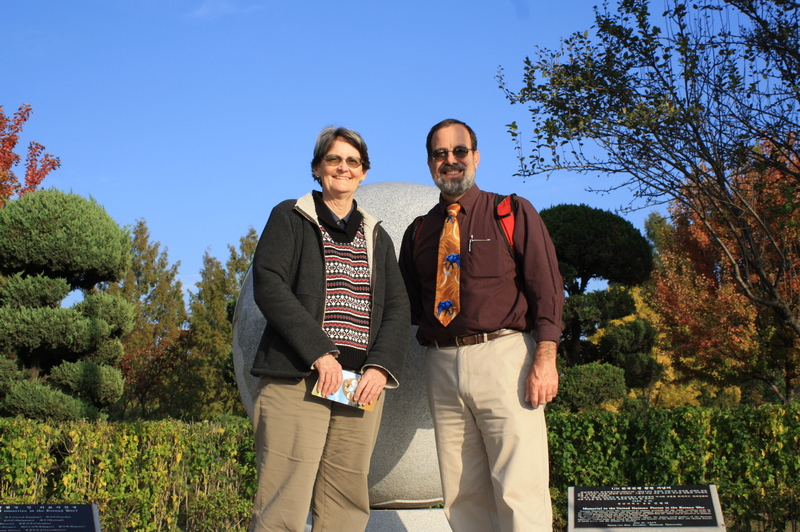 In addition to the visit to the University, where Sharon and her fellow teachers Jean Bird and Donna Perovich have been speaking to staff, students, and lab school folk from Korea, I’ve had the chance to visit several ministries, including a visit with our old friend Sue Makin. 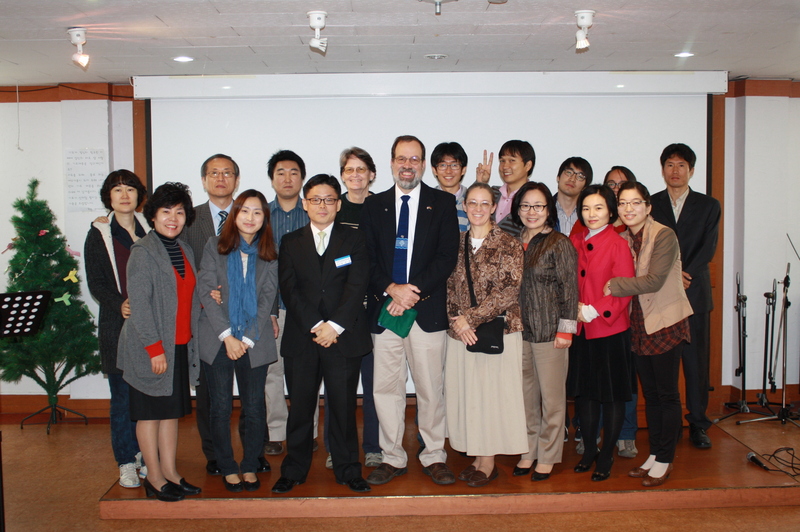 I was able to lecture at the Hannam University on Thursday, and I’ll be preaching at Sue’s church on Sunday the 30th. This is a part of the world I never thought I’d have the chance to visit, but am so glad to have been here. I hope that these images can give you a sense of what we’re doing. This beautiful stream enhances the beauty of the folk village. 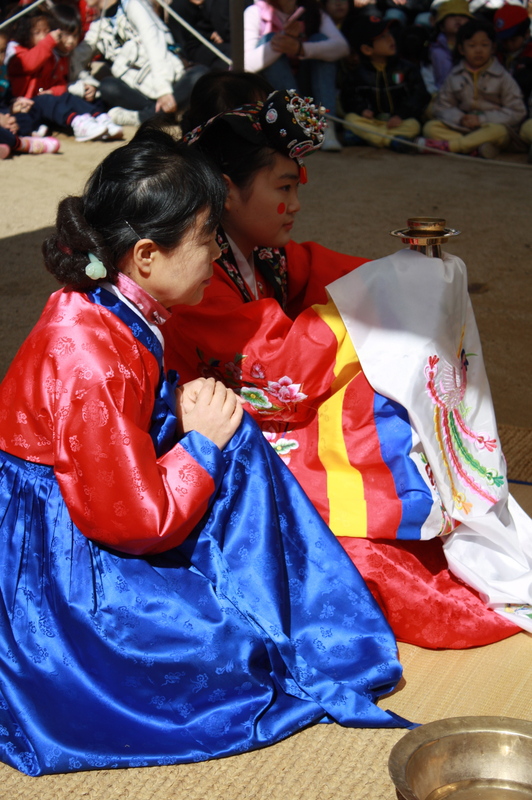 At the Korean Folk Village, a bride prepares for a traditional wedding ceremony. After the wedding, the bride gets in the little box that is carried by four porters, and the groom leads the way on horseback. This guy takes a slab of honey/rice dough and in a matter of minutes spins it into millions of "hairs" of sticky sweet confection. 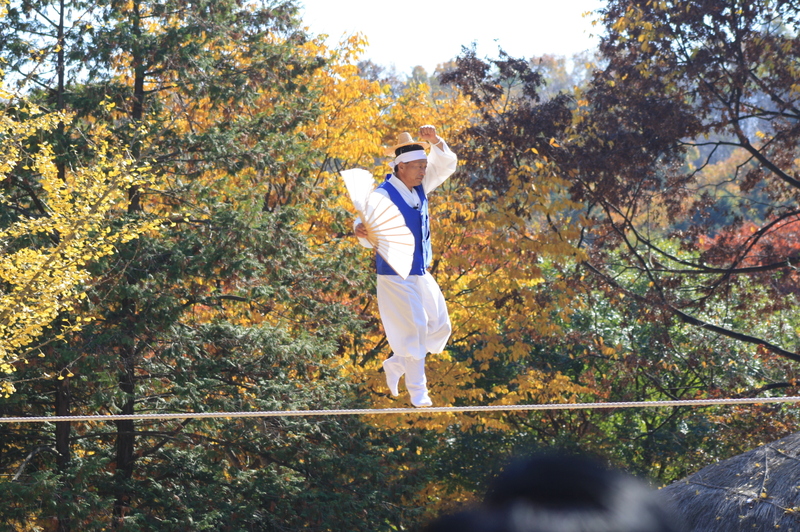 One of the demonstrations at the Korean Folk Village is the tightrope walker who strolled and bounced and just had fun on this rope. These six students took an evening off and treated us to dinner and a walk through one of the vibrant neighborhoods of the city. The title of this post is the opening line from Robert Frost’s excellent poem The Mending Wall (first published in 1915). If you click on that link before you read the rest of my story, you’ll hear one part of the background noise in my head as I spent the day on Wednesday, when we visited the Demilitarized Zone, an eerily beautiful and quiet corridor that separates North and South Korea. 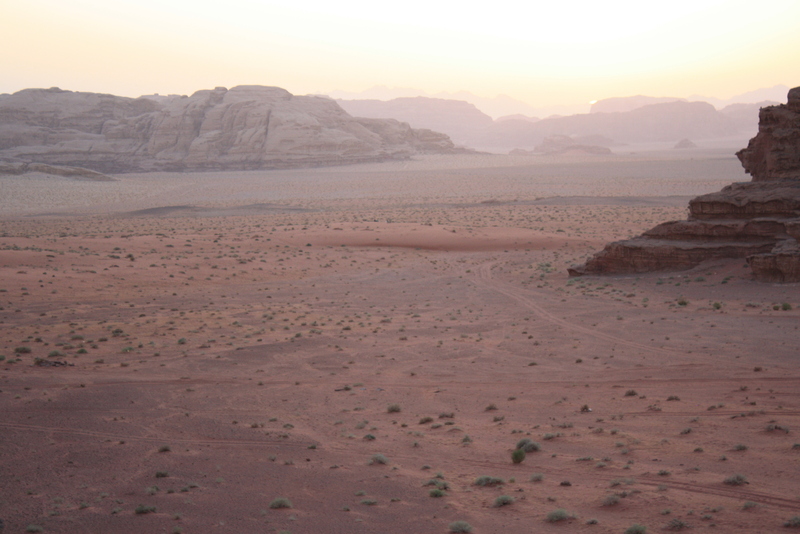 Take a look at that link and you’ll read the history of this fascinating and awesome place – a swath of land several kilometers wide where armies stare at each other across fields of green grass and generations of mistrust. 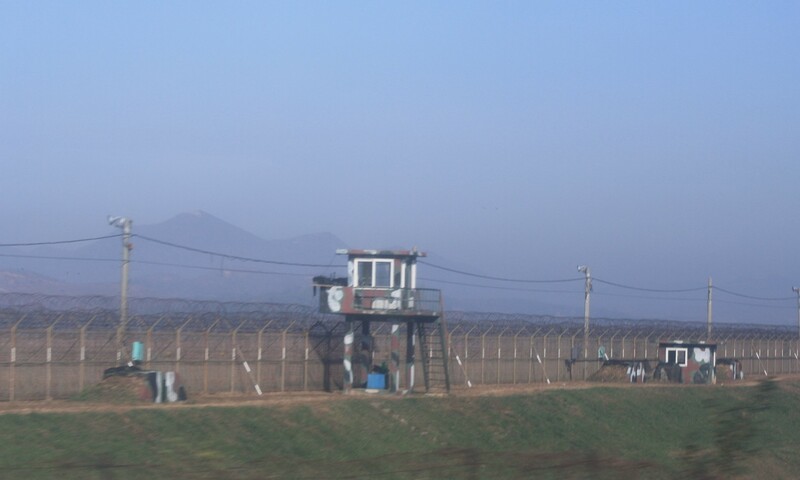 Guard stations like this line the highway en route to the DMZ from Seoul. We joined a group that rode the bus north from Seoul about an hour or so and arrived at the military checkpoint. After clearing inspection (by Korean and US military forces) we proceeded to one of four tunnels that have been discovered in the last forty years. Although the North Korean government vehemently denies this, it is easily apparent that each of these tunnels was dug for the purpose of moving large numbers of troops and weaponry across the DMZ and into the South. We walked down into the “Third Tunnel of Aggression” and went very nearly to the border (underground), imagining how difficult the labor of the construction of that project must have been. From the tunnel, we went to an observation point where visitors can peer into North Korea and watch folk farming the land, working on their homes, and, well, watching back. The final stop was a visit to a newly-constructed railway station – a wonderfully modern and sprawling station that is, for now, the “end of the line”. The South Koreans built it about ten years ago in the hopes that the relationship between the two Koreas would thaw to the point where visits from one side to the other might be possible.. This sculpture shows the hope for reunification. 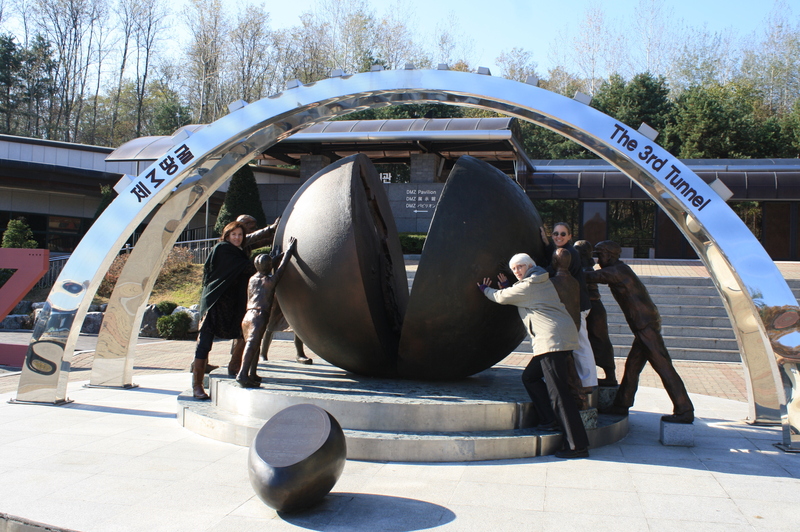 Inside the globe are matching images of North and South Korea waiting to be joined together. As I spent this somber day in that odd combination of tourist awe and human sorrow, something in me shivered. Robert Frost’s poem includes a character who insists that “good fences make good neighbors”. Maybe there’s something right about that, but it seems wrong to me. I thought about the fact that I am a member of what must be a very small club: I have stood at more famous (or infamous) walls than anyone I know. In 1987, I stood in West Berlin and watched the communist guards patrolling the top of the Berlin Wall. In more recent years, I have walked the so-called “Separation Barrier” between the Israelis and the Palestinians and the “Border Fence” that separates the USA from Mexico. 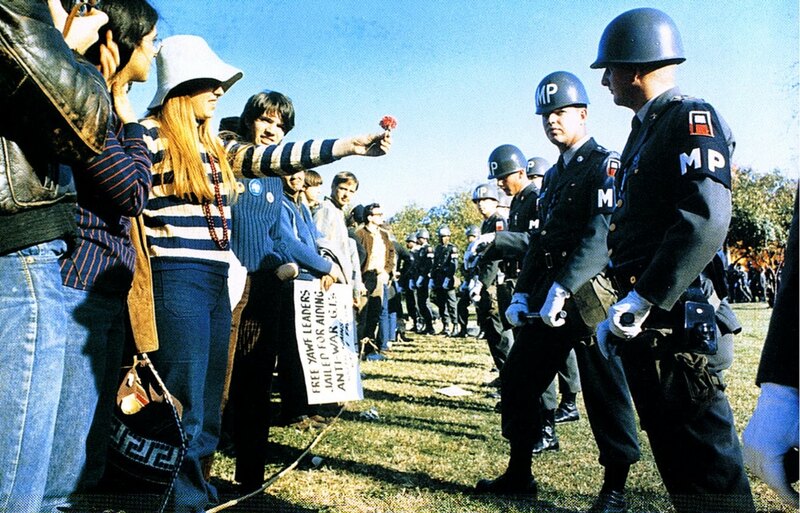 In each of these locations, I’ve observed heavily-armed soldiers keeping close watch on civilians that, depending on which side of the wall they were on, appeared to be frightened, concerned, bemused, or blissfully ignorant. 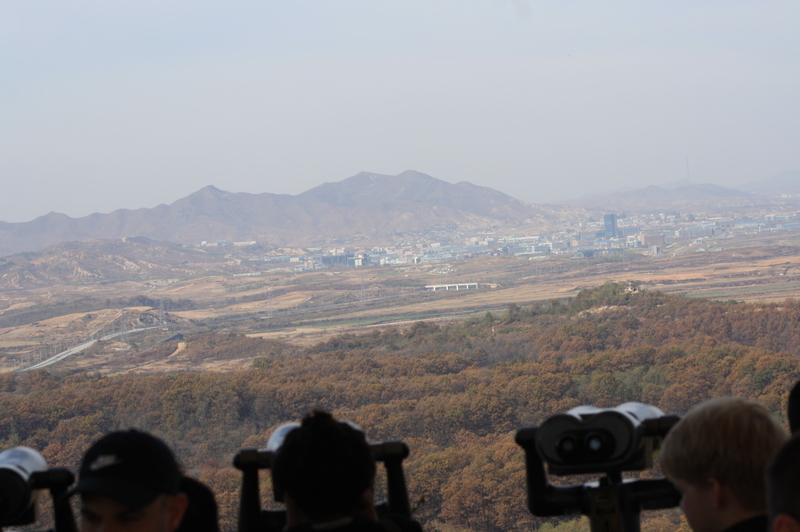 On the observation deck, the tourists peer across the DMZ into North Korea. I rode the train today with a young Korean student who is not a Christian, but who had lots of questions about Christianity. She wondered why the people who acted in the name of the Christian God were so often so cruel to those that they encountered. I didn’t have any good answers for her, only to say that the intention of Jesus was that love and justice come together in a way that allows God’s reign to be experienced as a good gift. She didn’t want me to preach to her, and I did not. But in her questions, I experienced the ache of the world that fights against walls of hostility. I want to be ready for the changes that bring life and light when they occur, and I am bold enough to think that in our prayers and in our lifestyles, we can be part of them. I don’t like walls…but I will keep visiting them in hope and faith. 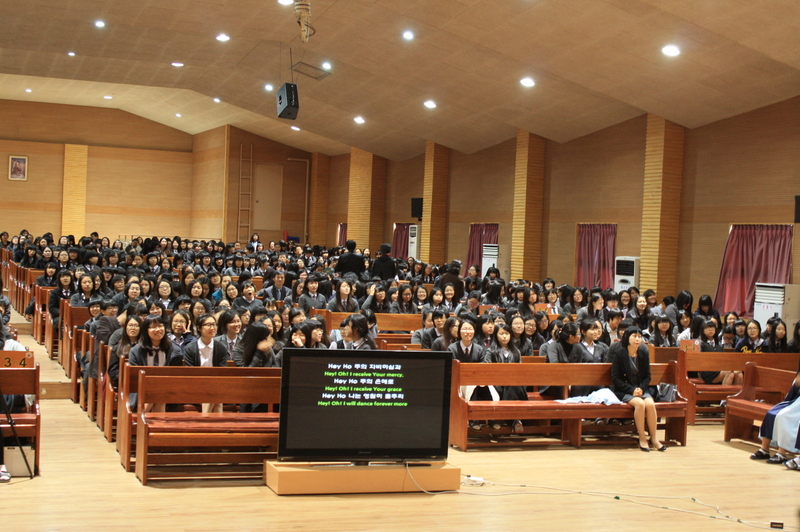 Some of EWHA Media High School's student body during chapel. 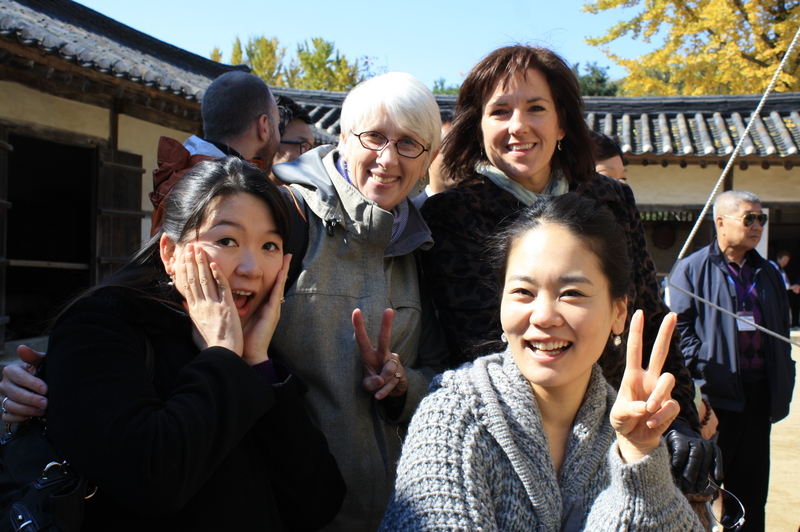 When we were invited to come to Korea, I asked if it were possible for me to spend some time in the Christian Community here, hoping that I could learn something from them and to be encouraged by the church here. Today was a “home run” in that regard. 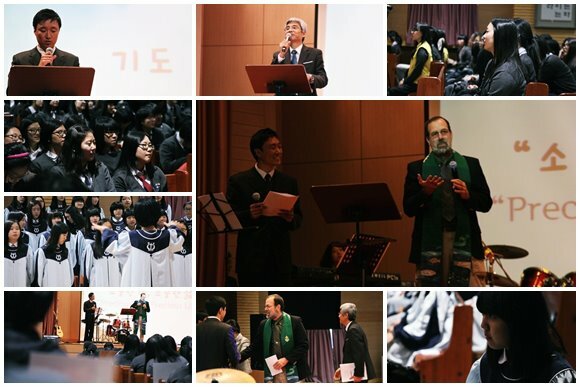 The EWHA Media High School is a Christian School with 750 students, all of whom were gathered in the chapel this morning just after 8 a.m. when the chaplain, Pastor Lee, led us into the room. 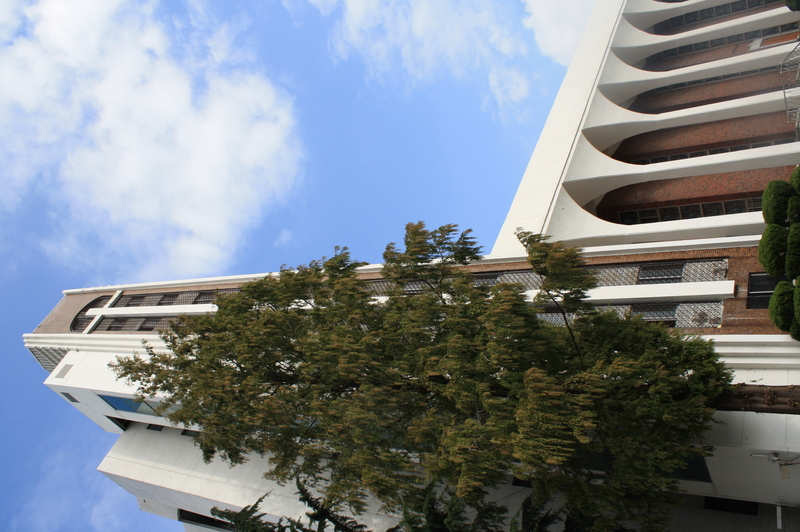 The building pulsed with energy as a student-led band played a mix of Korean and Western praise songs. There were about eight students on the platform leading the singing, and there were probably another dozen song leaders spread throughout the room. There were three giant screens in the front of the room, so everyone could see the words. It was joy- and energy-filled! Sometimes, I'm accused of "preaching to the choir." Guilty as charged, your honor. 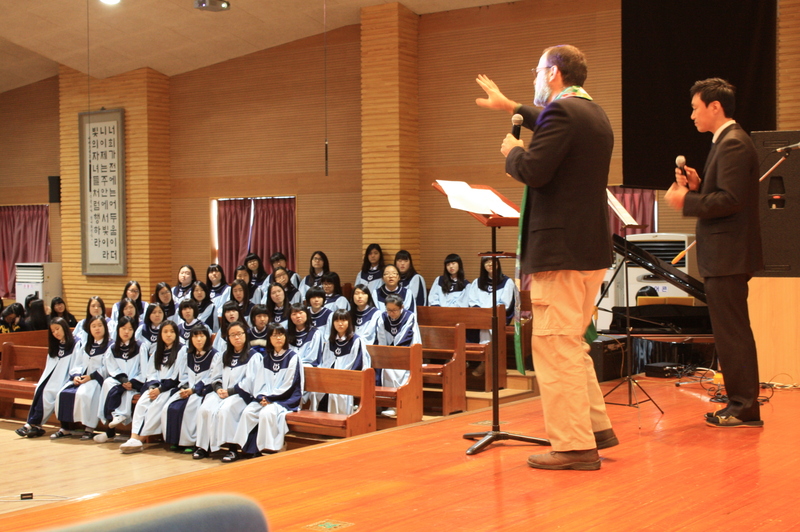 I started my sermon by saying, “I love Korea!” and the girls went wild with laughter and applause. They really clicked with my style of preaching and while the translator was helpful for some of the older folks in the room, I have a hunch that the students didn’t need much help. The message I shared was based on one I’d preached at CHUP a few months ago (posted here earlier this year), and the message about God’s love for us being powerful and complete seemed to hit home with the girls in the room. There was a lot of laughter and candid response at various points in the sermon, and although I’m sure it’s simply because I was a guest speaker who preached in English, the student body erupted in applause and laughter after the worship ended. Later, as we toured the school, it was a real hoot to run into smiling and excited schoolgirls for whom that message and our presence seemed to have made a real difference. 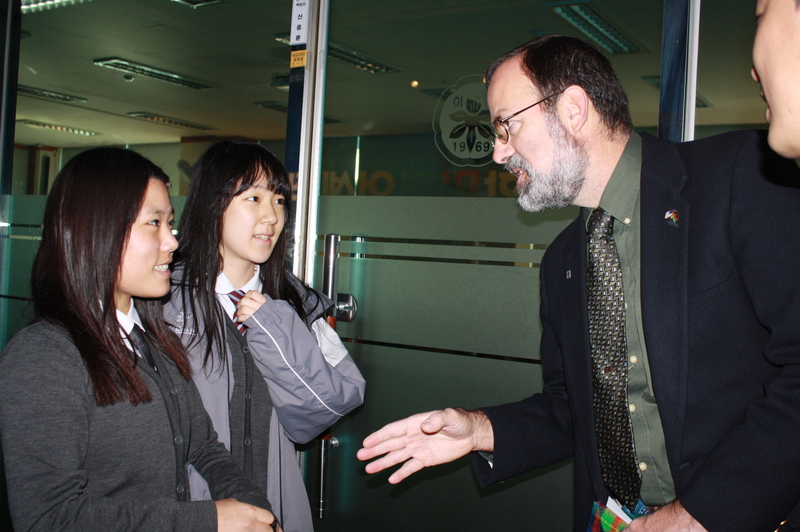 Ye Jin and Song-Iy were two students who greeted us warmly and requested prayer. This group of Seniors is one month from taking the Korean version of the SAT’s. Just a typical reaction to my preaching most mornings…. If you’ve read the previous post on our worship at the SaRang Community Church in Seoul, you’ll know that I was really blessed and challenged by the worship on Sunday. I have to say that it’s been a long, long time since I flat-out enjoyed and appreciated worship as much as I did this morning. 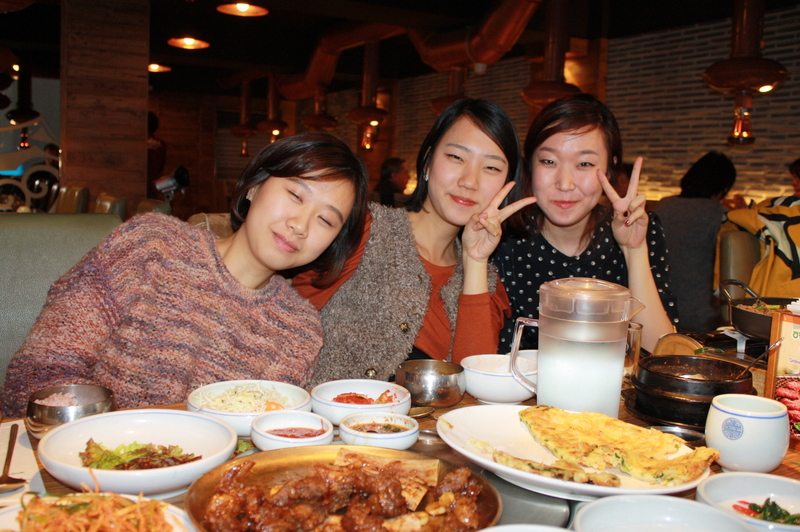 Before coming to EWHA, I was told to be careful in my preaching, as many of the students here are not Christian. They attend the school because it offers excellent education. The hope is that in the process of attaining this education, students will come into contact with the grace and love of the Lord. 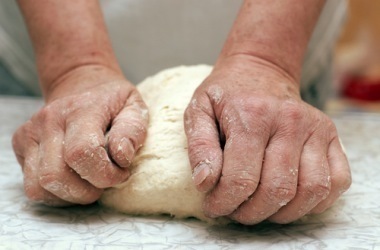 I’m thrilled to say that I saw that process in action this morning. Thanks be to God! 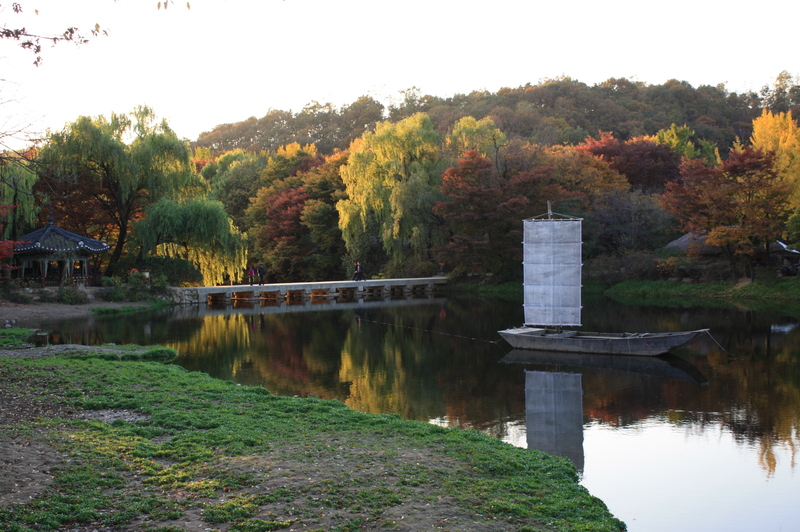 If you’d like to see a little bit about the school, check out their link here (it’s in Korean, but it’s really cool). There’s also a story about the school, which happens to be in partnership with Edinboro University of PA, here. All the cars on the left are lined up waiting to park in the church lot...as far as you can see! I thought, having been around church as much as I have in the last five decades, that I’d heard and seen it all. Until today. But make it we did. She dropped us off at the entrance to a large office complex where there were hundreds of people milling about. 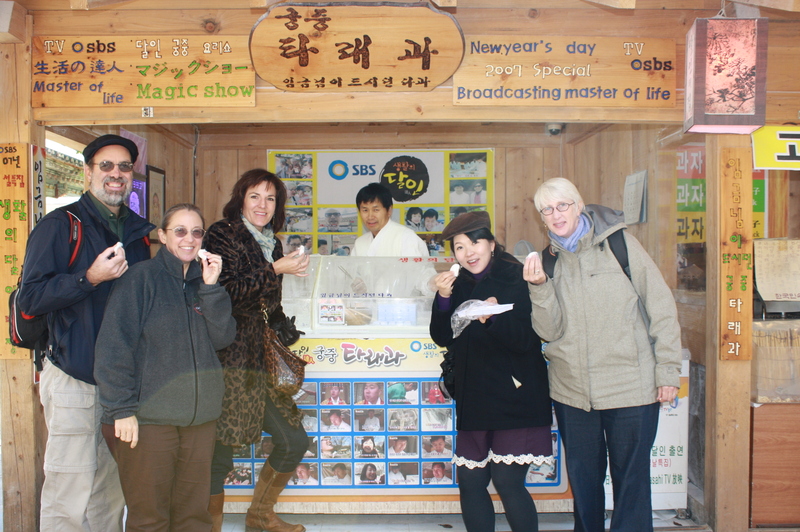 We stopped at the welcome table and borrowed headsets that would allow us to hear the service translated into English. Then we got into a long line of people who were waiting to get into the 10 a.m. service. At 9:15, the crowd from the 8:00 service came out and we made our way in. By 9:40, the sanctuary was filled with several thousand people, including a worship band of about a dozen, a string orchestra of about thirty, and a choir of more than a hundred. The congregation gathered with praise music and promptly at 10, the worship began. And you’re thinking, “So we get it, Dave. It’s a big church. You were impressed.” And that’s right. But I’ve been in big churches before. It was what the pastor said when he began his sermon that really got me. “Today, I’m going to have to cut the sermon a little bit short, because we have 599 people who will be baptized or confirmed today. So, pay attention and don’t get lost.” 599 people. Today. That’s not a typo. Now, because we were only at one of the six services today, there were only 44 baptisms during our service, and only 56 people who made their profession of faith. I was impressed by the depth and the reach of this congregation. As I said, there are 60,000 members. In addition to participating at worship regularly, the goal is for each of these Christians to participate in a small group. To that end, each of the congregation’s 80 (eighty) pastors mentors 12 leaders each year. These 960 leaders then lead groups of 5 – 8 people who gather weekly for prayer and Bible study. The result is a worship service that is deep with passion and conviction. The music was simply outstanding; the sermon was biblically based and a great mixture of challenge and affirmation; it was God-focused and believer-strengthening. I was fed. Let me tell you, those noodles are slippery when you're using stainless steel chopsticks! 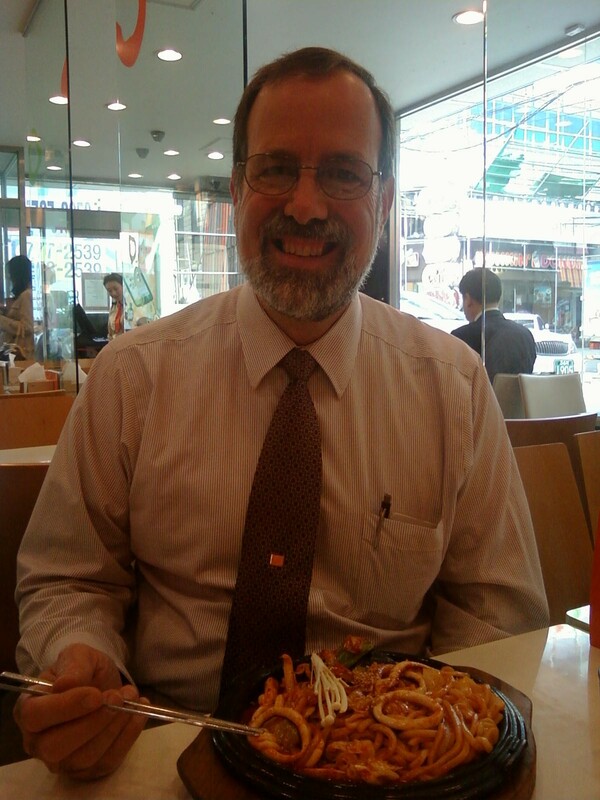 Following worship, we stopped into a Korean fast food restaurant called Shin Mandoo (New Dumpling House), where I had a bowl of spicy noodles and seafood (fortunately, my attempts to use the stainless steel chopsticks resulted in a spattering of my shirt that provided me with a memory of this delicious meal all day long). 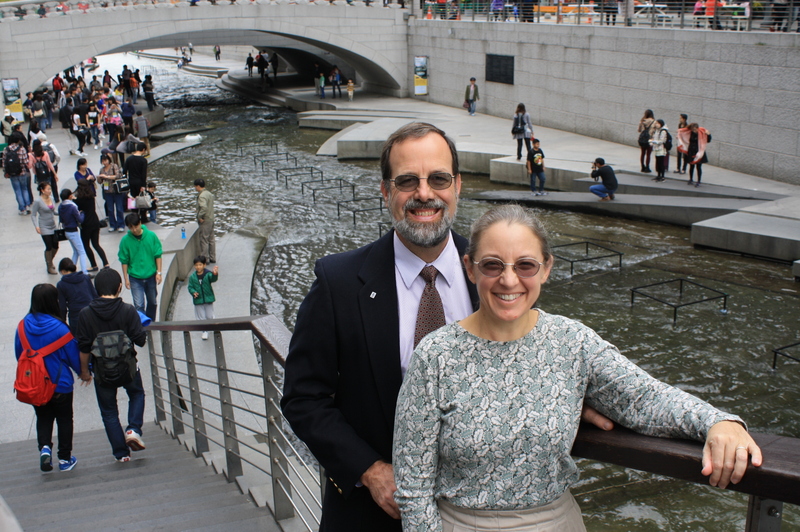 After lunch, we enjoyed a tour of the city center, including a great visit to the Cheonggyecheon, a delightful urban riverwalk that reminded me of San Antonio, TX – only without all the shopping! 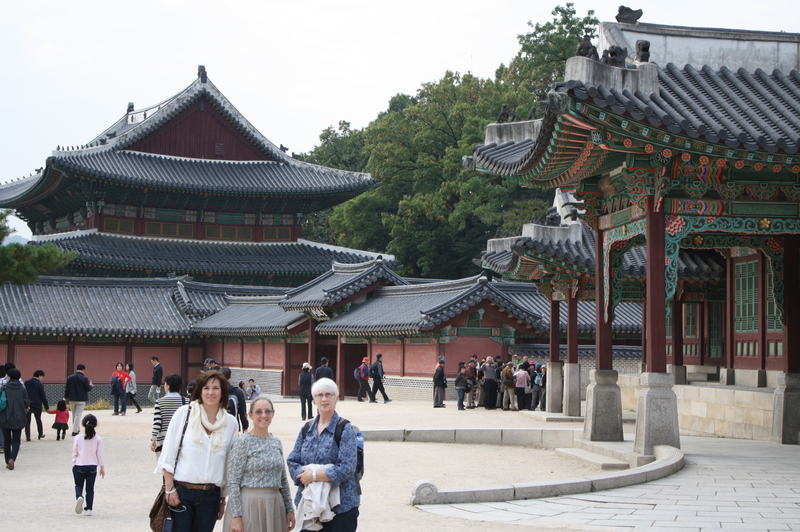 We also toured Changdeok Palace and the Jongmyo Shrine, which provided us with very helpful historical and cultural background as we begin our visit. 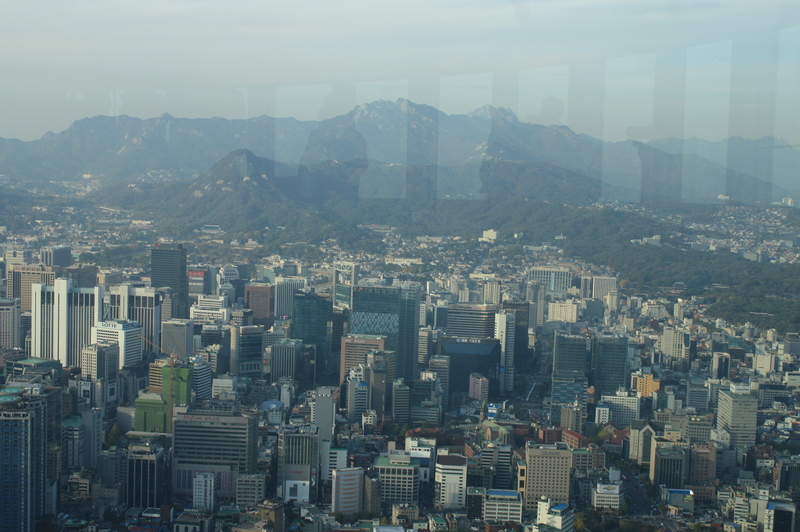 The day was capped off by a luxurious meal on the 23rd floor of the Shilla Hotel, which afforded us a panoramic view of this metropolis that is home to about 13 million of Korea’s 50 million people. 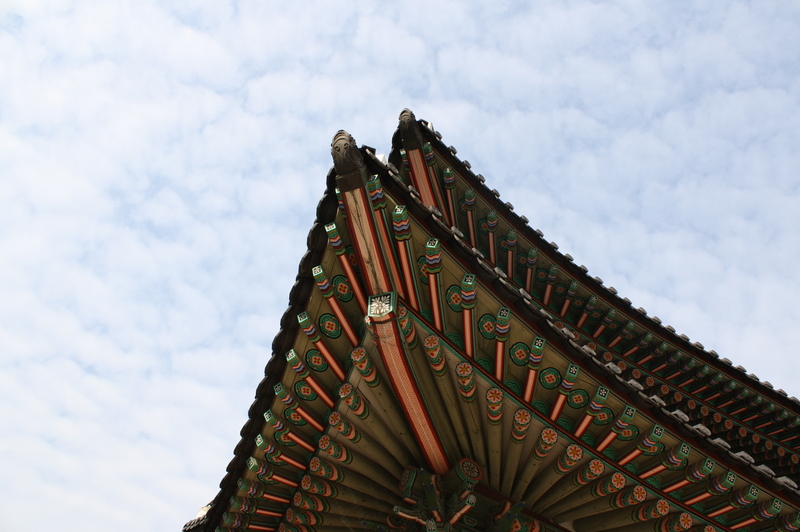 Changdeok Palace contains many examples of beautiful architecture. I just received word that my collection of Christmas stories, I Will Hold My Candle and Other Stories for Christmas, is now available for mass consumption via several web pages. My friend Byron Borger has been stocking the title at Hearts and Minds Books in Dallastown PA for a couple of weeks. If you contact Byron, you will support an independent bookseller AND he’ll give you 20% off the book. If you prefer to do your shopping via the internet, you can buy the book on Amazon.com or through Barnes and Noble’s web service.